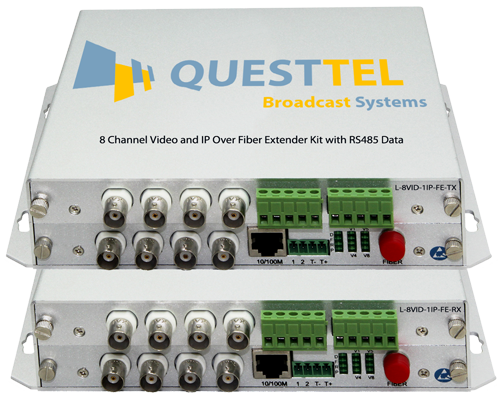 The L-1VID-1IP-FE-TX-RX is a 1 Channel Video + 1 Channel reverse Data +10/100M Ethernet optical transceiver, which adopts the most advanced international technology of digital video and optical fiber transmission, performing synchronous, undistorted, uncompressed and high quality signal transmission over all kinds of optical fiber. The L-2VID-1IP-FE-TX-RX is a 2 Channel Video + 1 Channel reverse Data +10/100M Ethernet optical transceiver adopts the most advanced international technology of digital video and optical fiber transmission, performing synchronous, undistorted, uncompressed and high quality signal transmission over all kinds of optical fiber. 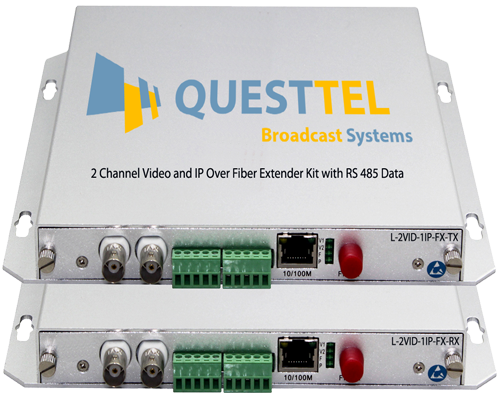 The L-4VID-1IP-FE-TX-RX is a 4 Channel Video + 1 Channel reverse Data +10/100M Ethernet optical transceiver, which adopts the most advanced international technology of digital video and optical fiber transmission, performing synchronous, undistorted, uncompressed and high quality signal transmission over all kinds of optical fiber. 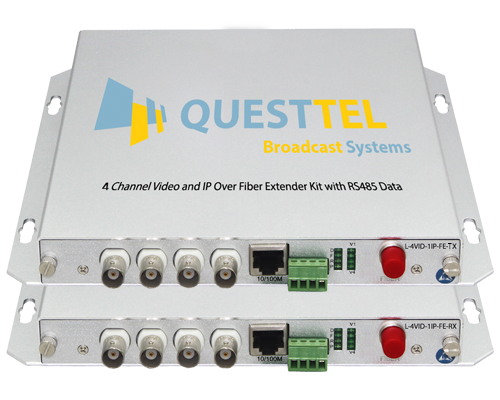 The L-8VID-1IP-FE-TX-RX is a 8 Channel Video + 1 Channel reverse Data +10/100M Ethernet optical transceiver adopts the most advanced international technology of digital video and optical fiber transmission, performing synchronous, undistorted, uncompressed and high quality signal transmission over all kinds of optical fiber. 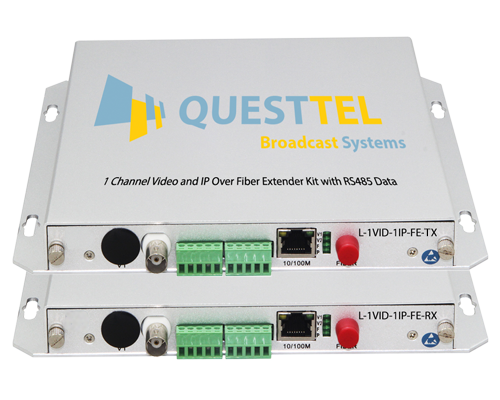 The L-1VID-1IP-FE-TX-RX is a 1 Channel Video + 1 Channel reverse Data +10/100M Ethernet optical transceiver, which adopts the most advanced international technology of digital video and optical fiber transmission, performing synchronous, undistorted, uncompressed and high quality signal transmission over all kinds of optical fiber. 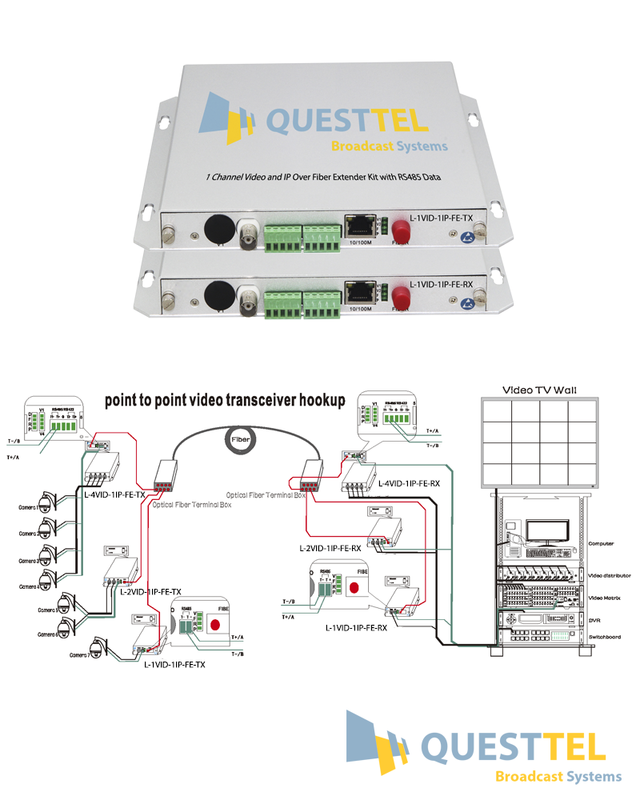 The QuestTel's Fiber Optical Transmitter & Receiver can be easily used in the normal operation by virtue of LED indication of working status, and without any electric or optical regulation on site. It can be installed independently or installed in 4U rack. Also the L-1VID-1IP-FE-TX-RX supports video regenerative relay and is compatible with PAL,NTSC,and SECAM formats. Disclaimer: Products, specifications and data are subject to change without notice, to improve reliability, function, design or otherwise. QuestTel shall have no liability for any error or damage of any kind resulting from the use of this document. Copyright © 2019 QuestTel. All rights reserved.